Submarine cables are laid using special cable layer ships, such as the modern René Descartes (ship), operated by Orange Marine. In 1858 the steamship Elba was used to lay a telegraph cable from Jersey to Guernsey, on to Alderney and then to Weymouth The cable being completed successfully in September of that year. Problems soon developed with eleven breaks occurring by 1860 due to storms, tidal and sand movements and wear on rocks. A report to the Institution of Civil Engineers in 1860 set out the problems to assist in future cable laying operations. Throughout the 1860s and 1870s, British cable expanded eastward, into the Mediterranean Sea and the Indian Ocean. An 1863 cable to Bombay, India (now Mumbai) provided a crucial link to Saudi Arabia. In 1870, Bombay was linked to London via submarine cable in a combined operation by four cable companies, at the behest of the British Government. In 1872, these four companies were combined to form the mammoth globespanning Eastern Telegraph Company, owned by John Pender. A spin-off from Eastern Telegraph Company was a second sister company, the Eastern Extension, China and Australasia Telegraph Company, commonly known simply as "the Extension". In 1872, Australia was linked by cable to Bombay via Singapore and China and in 1876, the cable linked the British Empire from London to New Zealand. Transatlantic cables of the 19th century consisted of an outer layer of iron and later steel wire, wrapping India rubber, wrapping gutta-percha, which surrounded a multi-stranded copper wire at the core. The portions closest to each shore landing had additional protective armor wires. Gutta-percha, a natural polymer similar to rubber, had nearly ideal properties for insulating submarine cables, with the exception of a rather high dielectric constant which made cable capacitance high. Gutta-percha was not replaced as a cable insulation until polyethylene was introduced in the 1930s. In the 1920s, the American military experimented with rubber-insulated cables as an alternative to gutta-percha, since American interests controlled significant supplies of rubber but did not have easy access to gutta-percha manufacturers. The 1926 development by John T. Blake of deproteinized rubber improved the impermeability of cables to water. The rising demand for these fiber-optic cables outpaced the capacity of providers such as AT&T. Having to shift traffic to satellites resulted in poorer quality signals. To address this issue, AT&T had to improve its cable laying abilities. It invested $100 million in producing two specialized fiber-optic cable laying vessels. These included laboratories in the ships for splicing cable and testing its electrical properties. Such field monitoring is important because the glass of fiber-optic cable is less malleable than the copper cable that had been formerly used. The ships are equipped with thrusters that increase maneuverability. This capability is important because fiber-optic cable must be laid straight from the stern (another factor copper cable laying ships did not have to contend with). Originally, submarine cables were simple point-to-point connections. With the development of submarine branching units (SBUs), more than one destination could be served by a single cable system. Modern cable systems now usually have their fibers arranged in a self-healing ring to increase their redundancy, with the submarine sections following different paths on the ocean floor. One reason for this development was that the capacity of cable systems had become so large that it was not possible to completely back-up a cable system with satellite capacity, so it became necessary to provide sufficient terrestrial back-up capability. Not all telecommunications organizations wish to take advantage of this capability, so modern cable systems may have dual landing points in some countries (where back-up capability is required) and only single landing points in other countries where back-up capability is either not required, the capacity to the country is small enough to be backed up by other means, or having back-up is regarded as too expensive. As of 2012, operators had "successfully demonstrated long-term, error-free transmission at 100 Gbps across Atlantic Ocean" routes of up to 6,000 km (3,700 mi), meaning a typical cable can move tens of terabits per second overseas. Speeds improved rapidly in the last few years, with 40 Gbit/s having been offered on that route only three years earlier in August 2009. Currently 99% of the data traffic that is crossing oceans is carried by undersea cables. The reliability of submarine cables is high, especially when (as noted above) multiple paths are available in the event of a cable break. Also, the total carrying capacity of submarine cables is in the terabits per second, while satellites typically offer only 1000 megabits per second and display higher latency. However, a typical multi-terabit, transoceanic submarine cable system costs several hundred million dollars to construct. Antarctica is the only continent yet to be reached by a submarine telecommunications cable. All phone, video, and e-mail traffic must be relayed to the rest of the world via satellite links that have limited availability and capacity. Bases on the continent itself are able to communicate with one another via radio, but this is only a local network. To be a viable alternative, a fiber-optic cable would have to be able to withstand temperatures of −80 °C (-112°F) as well as massive strain from ice flowing up to 10 meters (30 feet) per year. Thus, plugging into the larger Internet backbone with the high bandwidth afforded by fiber-optic cable is still an as-yet infeasible economic and technical challenge in the Antarctic. AAE-1, spanning over 25,000 kilometers, connects South East Asia to Europe via Egypt. The cable system will be constructed within the next 15 years. ↑ "The internet's undersea world" Archived 2010-12-23 at the Wayback Machine. – annotated image, The Guardian. ↑ Anton A. Huurdeman, The Worldwide History of Telecommunications, pp. 136–140, John Wiley & Sons, 2003 ISBN 0471205052. ↑ "Timeline – Biography of Samuel Morse". Inventors.about.com. 2009-10-30. Retrieved 2010-04-25. 1 2 3 4 5 6 7 8 Haigh, Kenneth Richardson (1968). Cable Ships and Submarine Cables. London: Adlard Coles. ISBN 9780229973637. 1 2 3 Guarnieri, M. (2014). "The Conquest of the Atlantic". IEEE Industrial Electronics Magazine. 8 (1): 53–56/67. doi:10.1109/MIE.2014.2299492. ↑ Brett, John Watkins (March 18, 1857). "On the Submarine Telegraph". Royal Institution of Great Britain: Proceedings (transcript). II, 1854–1858. Archived from the original on 17 May 2013. Retrieved 17 May 2013. ↑ Minutes of Proceedings of the Institution of Civil Engineers,. p. 26. 1 2 Kennedy, P. M. (October 1971). "Imperial Cable Communications and Strategy, 1870–1914". The English Historical Review. 86 (341): 728–752. doi:10.1093/ehr/lxxxvi.cccxli.728. JSTOR 563928. ↑ Rhodri Jeffreys-Jones, In Spies We Trust: The Story of Western Intelligence, page 43, Oxford University Press, 2013 ISBN 0199580979. ↑ Jonathan Reed Winkler, Nexus: Strategic Communications and American Security in World War I, pages 5–6, 289, Harvard University Press, 2008 ISBN 0674033906. ↑ Headrick, D.R., & Griset, P. (2001). Submarine telegraph cables: business and politics, 1838–1939. The Business History Review, 75(3), 543–578. ↑ "The Telegraph – Calcutta (Kolkata) | Frontpage | Third cable cut, but India's safe". Telegraphindia.com. 2008-02-03. Archived from the original on 2010-09-03. Retrieved 2010-04-25. ↑ "Pacific Cable (SF, Hawaii, Guam, Phil) opens, President TR sends message July 4 in History". Brainyhistory.com. 1903-07-04. Retrieved 2010-04-25. ↑ "History of Canada-Australia Relations". Government of Canada. Archived from the original on 2014-07-20. Retrieved 2014-07-28. ↑ "The Commercial Pacific Cable Company". atlantic-cable.com. Atlantic Cable. Archived from the original on September 27, 2016. Retrieved September 24, 2016. ↑ "Milestones:TPC-1 Transpacific Cable System, 1964". ethw.org. Engineering and Technology History WIKI. Archived from the original on September 27, 2016. Retrieved September 24, 2016. ↑ Blake, J. T.; Boggs, C. R. (1926). "The Absorption of Water by Rubber". Industrial & Engineering Chemistry. 18 (3): 224–232. doi:10.1021/ie50195a002. ↑ Ronalds, B.F. (Feb 2016). "The Bicentennial of Francis Ronalds's Electric Telegraph". Physics Today. doi:10.1063/PT.3.3079. Archived from the original on 2016-04-08. ↑ "Learn About Submarine Cables". International Submarine Cable Protection Committee. Archived from the original on 2007-12-13. . From this page: In 1966, after ten years of service, the 1608 tubes in the repeaters had not suffered a single failure. In fact, after more than 100 million tube-hours over all, AT&T undersea repeaters were without failure. ↑ "Submarine Cable Networks – Hibernia Atlantic Trials the First 100G Transatlantic". Submarinenetworks.com. Archived from the original on 2012-06-22. Retrieved 2012-08-15. ↑ "Light Reading Europe – Optical Networking – Hibernia Offers Cross-Atlantic 40G – Telecom News Wire". Lightreading.com. Archived from the original on 2012-07-29. Retrieved 2012-08-15. ↑ "Great Circle Mapper". Gcmap.com. Archived from the original on 2012-07-25. Retrieved 2012-08-15. 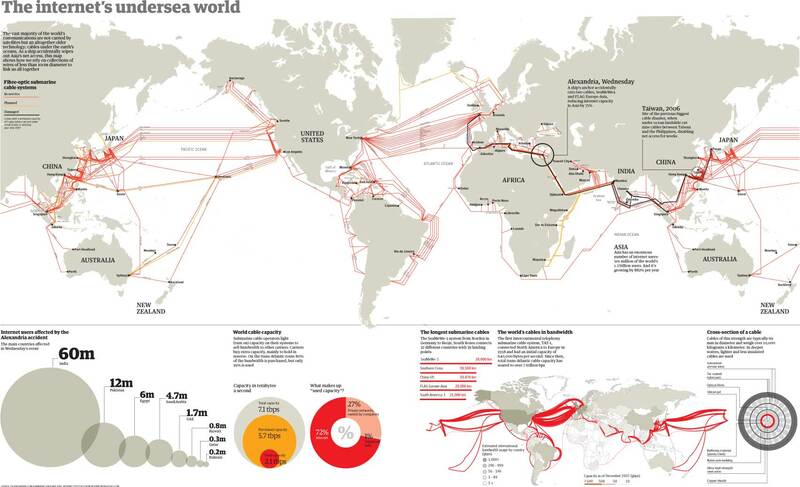 ↑ "Undersea Cables Transport 99 Percent of International Data". Newsweek. Retrieved 2016-11-16. ↑ Gardiner, Bryan (2008-02-25). "Google's Submarine Cable Plans Get Official" (PDF). Wired. Archived from the original on 2012-04-28. ↑ Australian Communications and Media Authority. (2010, February 5). Submarine telecommunications cables. ↑ Lindstrom, A. (1999, January 1). Taming the terrors of the deep. America's Network, 103(1), 5–16. ↑ McCarthy, Diane (2009-07-27). "Cable makes big promises for African Internet". CNN. Archived from the original on 2009-11-25. ↑ Tanner, John C. (1 June 2001). "2,000 Meters Under the Sea". America's Network. bnet.com. Archived from the original on 8 July 2012. Retrieved 9 August 2009. ↑ "Archived copy" (PDF). Archived from the original (PDF) on 2004-10-15. Retrieved 2010-04-25. CS1 maint: Archived copy as title (link) Shapiro, S., Murray, J.G., Gleason, R.F., Barnes, S.R., Eales, B.A., & Woodward, P.R. (1987). Threats to submarine cables. ↑ John Borland (February 5, 2008). "Analyzing the Internet Collapse: Multiple fiber cuts to undersea cables show the fragility of the Internet at its choke points". Technology Review. ↑ The Embassy of the United States of America. (1959, March 24). U.S. note to Soviet Union on breaks in trans-Atlantic cables. The New York Times, 10. ↑ Fine, I. V.; Rabinovich, A. B.; Bornhold, B. D.; Thomson, R. E.; Kulikov, E. A. (2005). "The Grand Banks landslide-generated tsunami of November 18, 1929: preliminary analysis and numerical modeling" (PDF). Marine Geology. Elsevier. 215 (1–2): 45–47. doi:10.1016/j.margeo.2004.11.007. Archived from the original (PDF) on June 30, 2007. ↑ "Top Story: Standby Net arrangements terminated in Pakistan". Pakistan Times. Archived from the original on 2011-02-13. Retrieved 2010-04-25. ↑ "Communication breakdown in Pakistan – Breaking – Technology". The Sydney Morning Herald. 2005-06-29. Archived from the original on 2010-09-02. Retrieved 2010-04-25. ↑ "Learning from Earthquakes The ML 6.7 (MW 7.1) Taiwan Earthquake of December 26, 2006" (PDF). eeri.org. Earthquake Engineering Research Institute. Archived (PDF) from the original on 21 November 2015. Retrieved 17 January 2017. ↑ "Vietnam's submarine cable 'lost' and 'found' at LIRNEasia". Lirneasia.net. Archived from the original on 2010-04-07. Retrieved 2010-04-25. ↑ "Finger-thin undersea cables tie world together – Internet – MSNBC.com". MSNBC. 2008-01-31. Archived from the original on 2010-09-16. Retrieved 2010-04-25. ↑ "AsiaMedia :: Bangladesh: Submarine cable snapped in Egypt". Asiamedia.ucla.edu. 2008-01-31. Archived from the original on 2010-09-01. Retrieved 2010-04-25. ↑ "SEA-ME-WE-4 Outage to Affect Internet and Telcom Traffic". propakistani.pk. Archived from the original on 2017-04-05. Retrieved 2017-04-04. ↑ PT (2011-03-14). "In Japan, Many Undersea Cables Are Damaged". gigaom. Archived from the original on 2011-03-15. Retrieved 2011-03-16. ↑ See TEAMS (cable system) article. ↑ Kirk, Jeremy (2013-03-27). Sabotage suspected in Egypt submarine cable cut. ComputerWorld, 27 March 2013. Retrieved from "Archived copy". Archived from the original on 2013-09-25. Retrieved 2013-08-25. CS1 maint: Archived copy as title (link) . ↑ Grubb, Ben (2014-12-02). "Internet a bit slow today? Here's why". Archived from the original on 2016-10-11. Retrieved 2016-09-11. ↑ "IMEWE submarine cable fault". Archived from the original on 2018-04-27. ↑ "PTCL commissions Pakistan operations of AAE-1 submarine cable system". Nicole Starosielski (2015). The Undersea Network (Sign, Storage, Transmission). Duke University Press Books. ISBN 978-0822357551.